Language is a powerful tool for building inclusion and exclusion at work. It can be used to create a sense of being valued, respected and one of the team or of being under-valued, disrespected, and an ‘outsider’. Inclusive language enables a diversity of people (e.g. different ages, cultures, genders) to feel valued and respected and able to contribute their talents to drive organisational performance. DCA has developed a new WordsAtWork* campaign for workplaces to show how inclusive language can improve workplace culture and drive productivity. David Morrison AO, DCA Chair, who appears in the campaign video #WordsAtWork, stressed the critical role language plays in shaping workplace cultures. “This new DCA campaign is not about being ‘politically correct’ – it is about encouraging people to use language at work which is respectful, accurate, and relevant to everyone,” said David. Research demonstrates that inclusive cultures are high performing cultures – they deliver greater performance and productivity. How we speak to and about each other influences how we treat each other, and this builds our workplace cultures. Non-inclusive language contributes to and continues stereotyping. Non-inclusive language harms people who witness it as well as the intended targets. When used in job interviews, non-inclusive language results in applicants from excluded groups finding the position less attractive, and experiencing less motivation and identification with the position than those who are exposed to inclusive language. Non-inclusive comments in the workplace can have an insidious effect on individuals from the excluded groups, impeding their advancement at work by presenting them as incompetent and not suitable for leadership roles. Frequent non-inclusive experiences at work have just as harmful effects as more intense but less frequent experiences (e.g. sexual coercion and harassment). Non-inclusive jokes can lead to tolerance of hostile feelings and discrimination against people from excluded groups. Language that may be fine outside of work can be noninclusive at work. Sometimes people can use terms about themselves or their friends that are not appropriate for others to use about someone in a work context. Be open to changing what you have always thought is ‘normal’, respectful and appropriate to say. You don’t have to be perfect – just be willing to learn. If you’re not sure what terminology someone prefers, just ask them! Ask the person or contact organisations which make up and represent given diversity groups. Focus on the person first, rather than the demographic group they belong to. Only refer to an individual’s age, cultural background, gender etc. if it is relevant. Sometimes our unconscious biases mean we can say things that exclude others – even when we do not intend to. DCA has developed a campaign video, a special message from David Morrison AO and a series of guides for workplaces to show how inclusive language can improve workplace culture and drive productivity. The new tools will help organisations build more inclusive workplaces which can result in benefits like improved productivity and profitability, greater creativity and innovation, higher employee wellbeing and engagement and reduced employee turnover, to name just a few. For employers this means very concrete bottom line financial benefits. 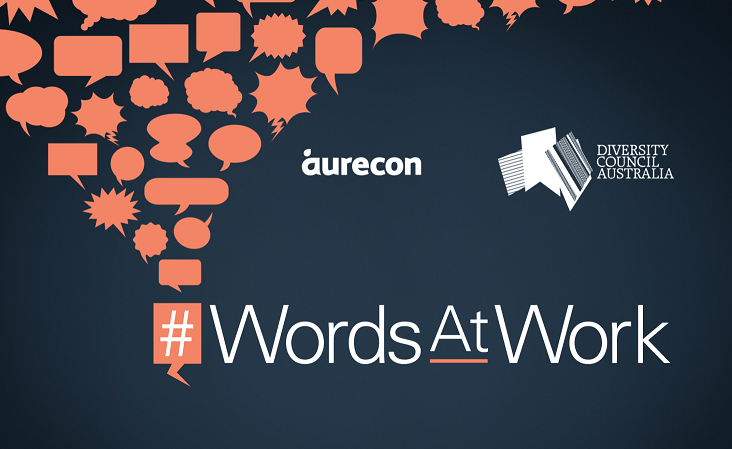 Building Inclusion: #WordsAtWork: A campaign for more inclusive workplaces is a partnership initiative between DCA and Aurecon and we sincerely thank Aurecon for their leadership and vision in supporting this project. Aurecon’s Global Chief Executive Officer, Giam Swiegers, said inclusive language is key to creating diverse and inclusive workplaces. “At Aurecon we work with clients and staff in regions as culturally diverse as South Africa, the Middle East, Asia and Australia and New Zealand. As a global engineering and infrastructure advisory company we are committed to becoming a more innovative organisation that provides unique solutions to our clients’ challenges. This can only be achieved in a work environment where everyone can feel valued and is therefore willing to contribute. Inclusive leadership and inclusive language gets to the heart of creating diverse organisations. Our partnership on the #WordsAtWork project in particular is an example of the progress Aurecon is making with its diversity and inclusion effort,” said Giam. DCA members can access additional resources including a quick summary of the campaign, and six specific guides covering diversity dimensions including gender, age, disability, LGBTI+, cultural and Indigenous, and a special message from David Morrison AO, DCA Chair. *WORDSATWORK is a Registered Trade Mark of Diversity Council Australia Limited.